The CAOS - Centro Arti Opifico Siri is an area of 6000 square meters born of the transformation of the former chemical factory ex Siri into a new center for modern and contemporary art that elevates the city of Terni to new center of umbrian contemporary. It houses inside the Pinacoteca Comunale, formerly stationed at Palazzo Gazzoli, the Museum of Modern and Contemporary Art Aurelio De Felice, the archaeological museum, a new modern kind of conviviality called FAT-place of culture, bar and bookshop, a theater of 300 seats and a library. 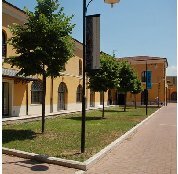 Art and culture are therefore in Terni fertile space where they can express themselves in the multitude of aspects including through active experimentation by visitors, who become part of the laboratories through the process of promoting cultural and artistic value.